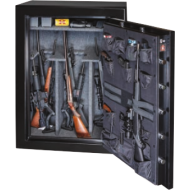 The Gardall GF6040 is a practical gun safe with height of 55 inches on the interior for storage of over 32 long guns (potentially can store 47 rifles). It has both fire protection and burglary protection. It was tested at 1200F (way above the temperature of an average hous fire). 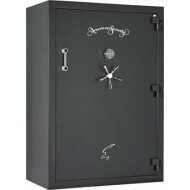 In addition this gun safe has an intumescent door seal. Security features include 7 active 1 1/2" bolts, a UL Group II lock with drill protection, four anchoring bolts to bolt the safe to the foor. 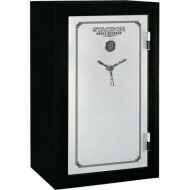 Due to the weight and size of this safe, we highly recommend our inside delivery service. 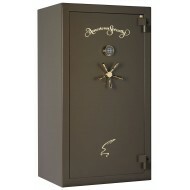 This Stack-On 36 capacity gun safe has great looks and great security. 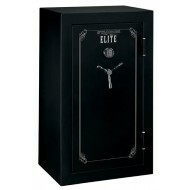 Have the peace of mind of knowing you are storing your firearms in a fire rated and waterproof Stack-on gun safe. The exterior finish is grey and silver attractive paint with chrome accents. Its interior is fully carpeted, protecting its contents from scratches. 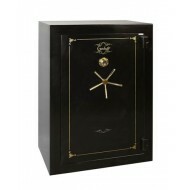 The Stack-On gun safe has a re-configurable interior. Set it up with the number of shelves you chose. The electronic key pad lock is fast, easy to use, and you can change your code at any time.